"Not everybody needs to go to a coding boot camp but they probably do need to know Excel"
Digital technology is disrupting the American workforce, but in vastly uneven ways, according to a new analysis of 545 occupations in a report published today by the Brookings Metropolitan Policy Program. 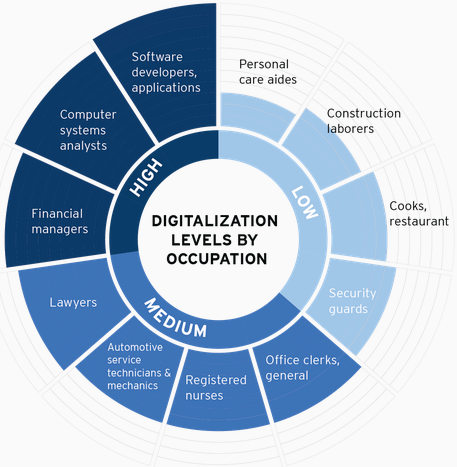 The report, “Digitalization and the American workforce,” provides a detailed analysis of changes since 2001 in the digital content of 545 occupations that represent 90 percent of the workforce in all industries. It suggests that acquiring digital skills is now a prerequisite for economic success for American workers, industries, and metropolitan areas. In recent decades, the diffusion of digital technology into nearly every business and workplace, also known as “digitalization,” has been remaking the U.S. economy and the world of work. The “digitalization of everything” has increased the potential of individuals, firms, and society, but has also contributed to troublesome impacts and inequalities, such as worker pay disparities across many demographics, and the divergence of metropolitan economic outcomes. While the digital content of virtually all jobs has been increasing (the average digital score across all occupations rose 57 percent from 2002 to 2016), occupations in the middle and lower end of the digital skill spectrum have increased digital scores most dramatically. Workers, industries, and metropolitan areas benefit from increased digital skills via enhanced wage growth, higher productivity and pay, and reduced risk with automation. The report offers recommendations for improving digital education and training while mitigating its potentially harmful effects, such as worker pay disparities and the divergence of metropolitan area economic outcomes. Wages: The mean annual wage for workers in high-level digital occupations reached $72,896 in 2016 — a 0.8 percent annual wage growth since 2010, whereas workers in middle-level digital jobs earned $ 48,274 on average (0.3 percent annual wage growth since 2010), and workers in low-level digital occupations earned $30,393 on average (0.2 percent annual wage decline since 2010). Uneven job growth: While job growth has been rapid in high and low digital level occupations, middle digital occupations (that can be more readily automated), such as office-administrative and education jobs, have seen much slower job growth. Automation: Nearly 60 percent of tasks performed in low-digital occupations appear susceptible to automation, compared to only around 30 percent of tasks in highly digital occupations. Gender: Women, with slightly higher aggregate digital scores (48) than men (45), represent about three quarters of the workforce in many of the largest medium-digital occupational groups, such as health care, office administration, and education. But men continue to dominate the highest-level digital occupations, as well as lower digital occupations such as transportation, construction, natural resources, and building and grounds occupations. Race/ethnicity: Whites and Asians remain over-represented in high-level digital occupations such as engineering, management and math professions; blacks are over-represented in medium-digital occupations such as office and administrative support, community and social service, as well as low-level digital jobs; and Hispanics are significantly underrepresented in high-level digital technical, business and finance occupational groups. 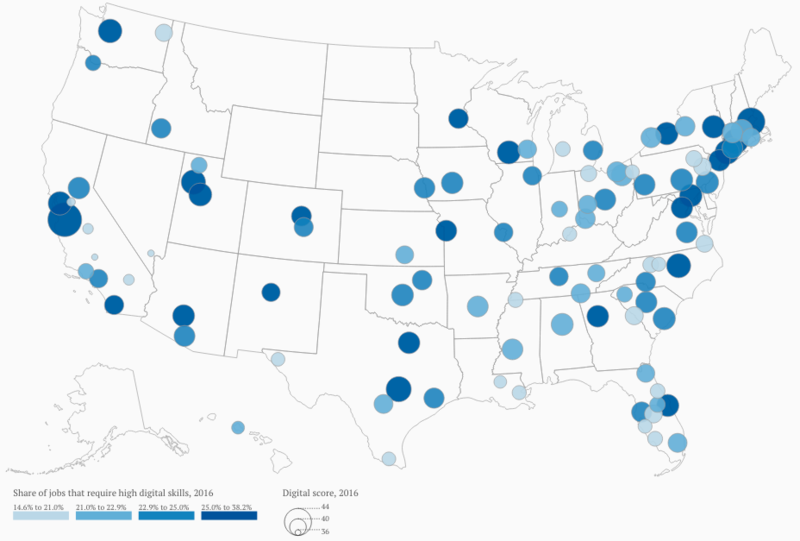 Regional disparities: The most digitalized metros include Washington, Seattle, San Francisco and Boston; fast followers such as Austin and Denver; and university towns such as Madison and Raleigh. Locations with low digital scores include Las Vegas and several metros in California , including Riverside, Fresno, Stockton and Bakersfield.